men mechanical watches Jaragar brand luxury men’s automatic 6 hands genuine leather strap watches black auto date wristwatches Main Features: 1.100% brand new 2.automatic self wind mechanical movement( time,date display) 3.Band material :genuine leather strap 4.Weight: 93g approx 5.Case Diameter: 5.0 cm approx 6.Case thickness:1.4 cm approx 7.Band Width: 2.4 cm approx 8.band length: 25.5 cm approx(including watches) 9.waterproof: daily life waterproof ( not suitable to swim or shower etc.) 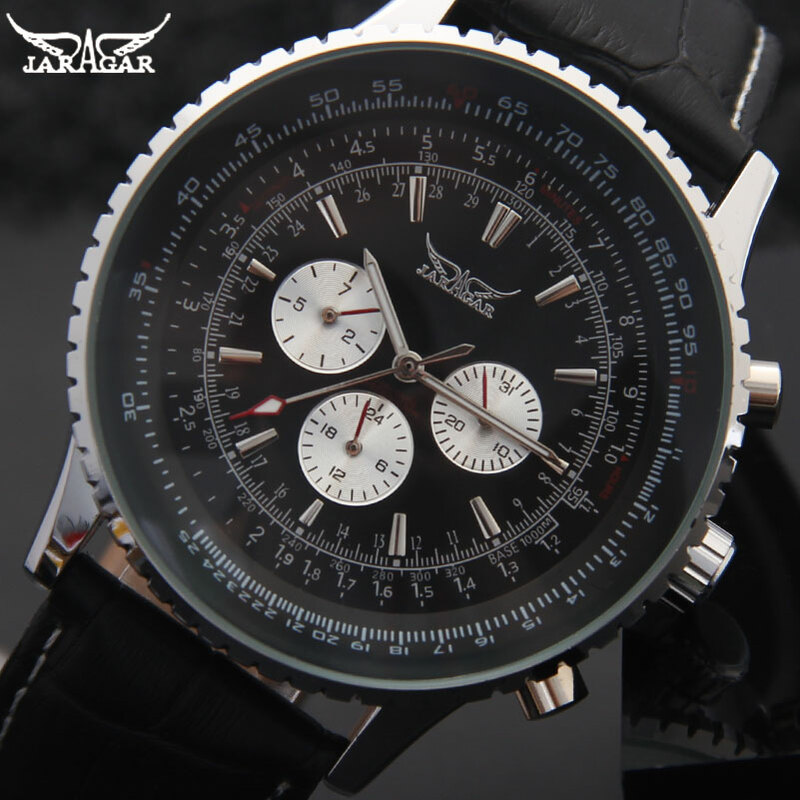 10.Color: white,black ATTENTION: 1, The mechaical watch allowed the time+- 60seconds per 24 hours. this is international mechanical watch rule. if anybody take care, please don’t buy. thanks Package Included: – 1 x Genuine Watch Warm Reminder: 1. For hand winding mechanical watch: The crown is motionless when it is in the first position. Rotate the crown deasil ,you— are winding the spring. The spring is full when the crown can not be moved under the normal power. Don’t move the crown any more, or else the spring will be broken or affect it’s elasticity. If it is the non-full movement, only need to circumvolve the crown 20 circles. The spring will last 24 hours continuous working when the crown is circumvolved full clockwise .We suggest you with the habit of win ding the spring every night before sleep. 2. For self-winding mechanical watch: You need to wear it more than 8 hours to ensure it work well as the spring winded itself by the movement of your arms .If you haven’t worn it for a long time, wind it for several times, or catch the band and make your watch a horizontal direction, and sway it 30seconds quickly to make the spring available before wear it, Begin the same operation before you get off the watch every night last 1week after you buy it. The time tolerance is ±60sperday in normal cases. 3. Time setting :Pull the crown to the second position for time setting .You can rotate the minute hands when you rotate the crown deasil or in anti-clockwise direction. Remember to push the crown back to the first position after finish the time. 4. Not to adjust time counterclockwise, but just clockwise. For some of the Six hands mechanical movements, do not adjust time counterclockwise at 1:00. Do not setting the Date/Week calendar during the time between 22:00-3:00.Pull the crown to the second position for time setting. 5. Winding full spring every day, or keeping moving your arm for more than 6 hours per day when you wear it, or making automatic balance waving for 7200 circles, all these method can ensure to supply enough power to watch for it’s 34 hours running. If less than 6 hours for daily use, please wind it. Shocks & vibration. Light activities will not affect your watch, but be careful not to drop your watch or hit it against hard surfaces, as this may cause damage. Magnetism The watch will be adversely affected by strong magnetism. Keep the watch away from close contact with magnetic object. (In the case of a quartz watch, normal accuracy will return if the watch is moved away from the magnetic field.) Chemicals. Be careful not to be expose the watch to solvents (example alcohol and gasoline), mercury (i.e., from a broken thermometer), cosmetic spray, detergents, adhesives or paints, Otherwise, the case, band, etc, may become discolored, deteriorated or damaged. Care of case and band. 1. To prevent possible rusting of the case and band by dust, moisture and perspiration, wipe them periodically with a soft dry cloth. 2. If there is a sticker or protect slice on the case back, please tear it before use the watch. Otherwise the sweat will permeate into the slice and cause the case back to get rusty.